Rebecca and Jed were the perfect couple to help us start off 2014. We're off to a great year with weddings. The day began with the girls getting ready at their family apple orchard just north of Elkhorn, WI. Having a unique, fun environment to take getting ready photos is always the way to go! Beautifully arranged photos were made by Crazy for You, and Rebecca wore a dress made by Casablanca and Betsy Johnson shoes. The ceremony took place at a country church practically across the street called Sugar Creek Lutheran Church. Everyone had to pack in, but with the cold winter air outside, I don't think anyone minded at all! All 400+ guests then traveled down to one of our favorite reception venues--The Starline--in Harvard, IL. The combination of old industrial and classy country creates a setting like no other to host your guests. 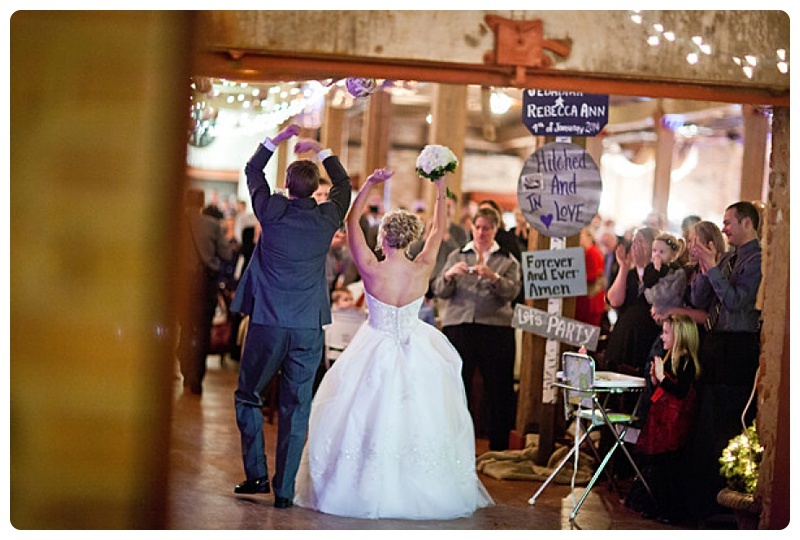 The handmade signs and decorations spread throughout the hall made everyone feel right at home. It was no easy task keeping such a large group on the dance floor but Joe Bruhn from Personal Touch DJ did an incredible job. Congratulations to the wonderful new couple Rebecca and Jed. We were so pleased to be a part of your special day!